Black and blue CybertronPC 5150 Unleashed GM1223F is a quad core gaming desktop with amazing performance and graphics for the best gaming experience. The PC tower has a cool design with a futuristic look and color options. High quality and powerful components are for fast and smooth processing while you are playing the latest 3D games, running memory intensive software or doing your daily thing on the computer. 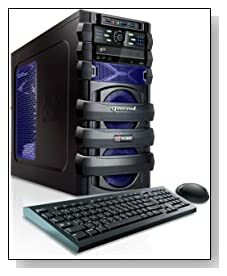 System is made up of an AMD FX 4100 quad core processor at 3.60GHz speed, 8GB DDR3 RAM, 1TB HDD and the 64-bit version of Windows 8. FX 4100 is a powerful processor that is also energy efficient. 8GB memory is great for running a few memory intensive programs and apps at the same time and 1TB hard drive is plenty of space to store lots of movies, games and other files. Windows 8.1 upgrade can be done for free through the Microsoft store and it is available for all Windows 8 customers. Radeon HD 6670 1GB is the graphics / video card that is ideal for gaming class graphics performance as it helps accelerate multimedia content. Cybertron desktop lets you over-clock the processor to operate faster up to 3.8 GHz and control the fan speed through the LED Front Panel Fan Control. It runs quietly and keeps cool- the case doesn't get hot because of large breathing space and fans don't have to work that much. Diamond cut aluminium black and blue Cybertron 5150 desktop has a 400 Watt power supply, weighs 27 pounds and has the dimensions of 19.2 x 7.5 x 17 inches. In terms of connectivity, you have a 24X DVD±RW Dual-Layer Drive, 4 x USB 3.0 ports, 5 x USB 2.0 ports, 1 x RJ-45, Network Ethernet 10/100/1000 Gigabit LAN, 802.11b/g/n Wireless, 1 x DVI, 1 x VGA, 1 x HDMI, 7.1 Channel Audio. It also allows expandibility with a few expansion bays and slots such as DIMM, PCI and external drive bays. Conclusion: For how much you pay, CybertronPC 5150 Unleashed GM1223F is one of the best gaming desktops you can get: Great multitasking, ample hard drive space, fast and powerful processor, modern futuristic design, solid build, highest quality components, 1 year parts and labor warranty and phone based lifetime hardware tech support for free. It is great for both gaming/entertainment and work/school as it will excel at no matter what you throw at it on a daily basis and make life easier for you.